Dental X-rays (or radiographs) help Dr. Chuck look under the gums at the roots of our pets’ teeth! These x-rays can help Dr. Chuck determine if a tooth needs help, if it can be saved, or if it has to be removed. Below are some examples of common X-ray findings during a dog or cat dental procedure. First a quick overview of a dental X-ray. Here is a picture of a tooth (it’s a cat lower premolar, if you are curious) and next to it is the X-ray of that same tooth. 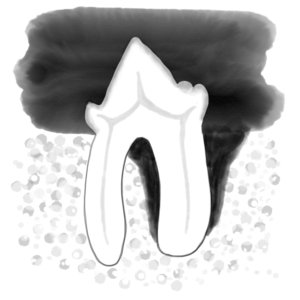 The air above the tooth is black. The tooth itself is bright white; including the crown of the tooth (the part that sticks out above the gums) and the roots. The periodontal ligament space (the connector between the tooth and the jaw bone) shows up as a dark outline. 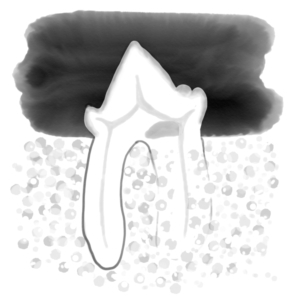 The jawbone itself is more porous than the tooth (has lots of little air bubbles) and looks speckled. For more about X-rays, check out our radiology page here. When we review a dental X-ray, we are looking for these key items: Is the tooth in one piece? Is any of the tooth missing? Is any of the bone missing? Can you trace the periodontal ligament space line all the way around the root? One of the most common reasons we have to extract (remove) a tooth is because bacteria have eaten away so much bone that the tooth is no longer held safely in the mouth. Now for our example teeth! This is a healthy tooth. The roots extend down into the bone of the jaw, and the periodontal ligament (which holds the tooth in the jaw) shows up all the way around the root as a thin black line. This tooth has plaque and infection. There is mild bone loss around the root of the tooth, but a dental cleaning will help this tooth stay in place and stay healthy. This tooth has a severe infection and has lost most of the bone around the base of the tooth. The gums have turned red with gingivitis. You cannot see the thin black line of the periodontal ligament space all the way around the roots. There is not enough bone left to hold this tooth in place, so it needs to be removed. This tooth also has an infection. The large dark area at the bottom of the root is where bacteria have eaten away at the bone. There may be a fracture on the other of the tooth that we can’t see from here which has caused the infection. This tooth needs to be removed, even though it looks healthy on the outside! 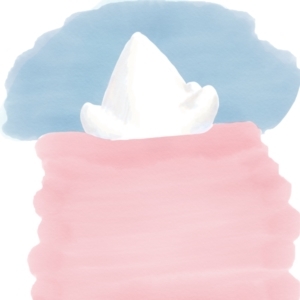 This tooth is dissolving. This is an example of a Feline Oral Resorptive Lesion, or FORL. This happens in cats (and sometimes dogs) and is thought to be due to an over-reactive immune system responding to bacteria in the mouth. The tooth will continue to dissolve, and needs to be removed to prevent infection. There is a hole in the crown of the tooth already (the red spot is blood filling the hole), and one of the roots is turning into bone! Crazy! Sometimes we can see evidence of these FORL’s in the crown of the tooth, but often the roots are dissolving while the top of the tooth looks perfectly normal; it’s only by taking an X-ray that we discover the whole tooth! I mean truth!